I wonder how differently one hears music when one has played, indeed, performed it oneself. The difference can doubtless be exaggerated and will always depend on a number of other factors too. It is, moreover, surely possible to listen critically to a performance of Tristan und Isolde, and indeed to write about it, without having conducted the work, let alone to have played or to have sung every part. Nevertheless, there is probably a certain insight – ‘in-hearing’? – which is likely to assert itself via the engagement of performance, even if it remains far from impossible otherwise to acquire it. I was led to such thoughts on this particular occasion since I realised that I had at some point, and in some cases more than once, performed each of these works in public. Indeed, such a bloody nose did I receive from a teenage performance of the D major Rondo that I swore I should never play Mozart in public again, realising with a vengeance the truth of Schnabel’s oft-quoted remark about music being better than it could be performed. It took me another fourteen years before I dared perform that particular piece again, though in the meantime I had actually played its more complex cousin, the A minor Rondo, also on this Wigmore Hall programme, a number of times in front of an audience. At the very least, then, bitter experience enables one to realise quite what an extraordinarily difficult task performing any piece of Mozart will always be; indeed, it would be unusual were one not to conclude that Mozart is the most difficult of all composers to perform well. In a field more than unduly littered with failures, Erich Höbarth and Susan Tomes acquitted themselves very well. Tomes is celebrated as a chamber musician, so I was interested to hear her in two solo rondos. The D major, KV 485, was fluent, nicely shaded, though to my ears at least lacking a sense of darker undercurrents. Many, I realise, would say that they are simply not there in so overtly sunny, even blithe, a work, but certain harmonic shifts would seem to imply otherwise. It was a good performance – I shudder when I even think of that teenage effort of mine mention above – but perhaps a little closer to the spirit of JC Bach than to the richness of Mozart. The A minor Rondo, which I have often thought Mozart’s single greatest work for solo piano, was sad, chaste, though none the less involving for that. Counterpoint was clear but, every bit as important, imbued with harmonic direction. At times, I might have wished for something more Romantic, especially in the build up to those climaxes at which Mozart really goes for the Wagnerian, even Bergian, jugular. Nevertheless, a more Classical reading, so long as it is not unduly understated or, worse, mechanised, has validity. No one could have doubted from Tomes’s performance that this was a towering masterpiece – though perhaps someone behind me did, given that she burst into inexplicable laughter at the end. Framing the two solo performances in both halves were violin sonatas or, strictly, sonatas for piano with violin accompaniment. (For what it is worth, they are not really: a performance of the piano parts alone would be a nonsense.) KV 305/293d, in A major, received a wonderful performance. The first movement was ebullient without sounding boisterous, Höbarth and Tomes exhibiting impressive unanimity without a hint of the clinical. They proved themselves flexible as the harmony demanded, or at least suggested. From the outset, and throughout the recital, I was impressed by the very real sense of a physical connection with Höbarth’s instrument; this was a true violinist, not a mere virtuoso. There was not the glossy perfection associates with certain celebrated and, frankly, boring players, but something far more rewarding and meaningful. So many players take the second movement far too fast. It was a relief that Höbarth and Tomes allowed plenty of space for the harmony to speak, their command of phrasing ensuring that the longer line unfolded without interruption. Mozart is already not so very distant from Beethoven here, so the variations emerged as properly weighty, in the sense of being consequential – and not just in the minor mode. Above all, the players communicated their love for the music – even above a quite extraordinary bout of bronchial intervention. The G major sonata, KV 379/373a, benefited from a rich, almost Beethovenian, sound to the piano introduction, matched by Höbarth’s violin response, equally rich and dignified. The Allegro was alert, finely articulated, and every bit as responsive to the demands of the harmony. Yes, there were moments of imperfect intonation, but the meaning of the notes was always fully apparent. Neither musician mistook vehemence for driving too hard. As with the second movement of the A major sonata, the intricacies of Mozartian variation form sounded not at all distant from Beethoven. There is a tendency amongst some musicologists as well as performers to underestimate Mozart and Haydn as writers of variations; that was rightly resisted here, or better, would never have occurred to either musician. Tomes notably relished both the syncopations and the richness of harmony. Each variation was characterised, not least the extraordinary Bachian – though it is a moot point how much of Sebastian Bach’s music Mozart would yet have known – fifth variation, which, with its piano decoration and violin pizzicato can hardly fail to put one in mind of certain slow movements from Bach’s piano concertos. And the whole was undoubtedly greater than the sum of the parts. The opening phrase of the E minor sonata, KV 304/300c, was imbued with Schubertian sadness, but Mozart’s imagination was soon shown to more variegated than that might imply. Indeed, the first movement was characterised by a passion that all but the most sentimental would recognise as operatic. There were passages when I thought that Höbarth, perhaps recalling his association with Concentus musicus Wien, might justly have applied a little more vibrato, but tonal warmth was certainly not neglected elsewhere. Mozart’s piano writing sounded, quite rightly, concertante in style at times. The nobility of contrapuntal utterance from the piano’s opening bars of the second movement marked it out as something quite special, counterpoint and melody proving properly indivisible. The E major trio emerged warm, hymn-like, as if from another (Zauberflöte-like) world, which in a sense it is. Tragic vehemence marked the sonata’s close. Few, I am sure, would contest the claim that the B-flat major sonata, KV 454, is one of Mozart’s greatest contributions to the genre. (To my mind, the A major sonata, KV 526, is the only work to match it.) The first movement’s introduction had due grandeur, eliciting a splendid feeling of release for the ‘launch’, as it were, of the exposition proper. Again, there was an entirely apt air of the piano concerto to much of the writing. Joy was not unalloyed – Mozart is always more ambivalent than Haydn, Handel, even Bach – but the fecundity of his operatic imagination sang through, indeed moulded, his conception of sonata form. Though the performance never went so far as to be hard-driven, there were occasions when I thought it might have yielded a little; I am nit-picking really though. The slow movement flowed without being harried. There was no doubt here as to Mozart’s operatic inspiration; this was revealed to us in its beauty, its darkness, all its ambiguities, as a sister-aria to those of the Countess, though of course such ‘influence’ runs both ways. If I might sometimes have preferred something a little more Romantic, that is neither here nor there. It is very tempting to take the Allegretto, despite Mozart’s marking, too fast to allow the richness of his melodic and harmonic genius properly to tell. Here the players arguably fell on the fast side, not absurdly so, for the music remained enjoyable and, at times, winningly theatrical. I could not help but think, however, that a slightly more measured approach might have offered a more penetrating interpretation. That was nevertheless one of very few reservations I harboured concerning an impressive recital. A friend has just brought to my attention a report (click here) concerning an extraordinary piece of German advertising. 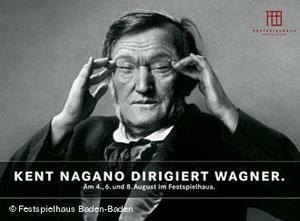 Can this brazenly racist depiction of Wagner metamorphosing into a caricature beyond crudity of Kent Nagano be for real? It looks as though it might have been rejected as not subtle enough for Der Stürmer. Most staggering of all, perhaps, is the fact that Michael Preiswerk, company board spokesman for the Art Directors Club, the advertising group that awarded the this image a gold medal prize (! ), commented: 'It's an excellent poster that goes beyond cultures to form a great work and that very strikingly and succinctly shows Asian culture. It's charming and funny and shows openness and multiculturalism.' I doubt that even Dr Goebbels would have been able to keep a straight face whilst delivering those words. Mit Bedauern und Unverständnis reagieren die Freunde & Förderer des Radio-Sinfonieorchesters Stuttgart auf die Entscheidung der Geschäftsleitung und Gremien des SWR, das Radio-Sinfonieorchester Stuttgart und das Sinfonieorchester Baden-Baden/Freiburg des SWR zu fusionieren. Eine Fusion, so der Förderverein, müsse als eine nicht wieder gut zu machende Fehlentscheidung gesehen werden, die landes- und kommunalpolitische Aspekte, kultur- und medienpolitische Argumente, künstlerische und musikpädagogische Gesichtspunkte sowie betriebswirtschaftliche Überlegungen außer Acht lasse. Nicht zu entschuldigen sei ferner der Image-Schaden, den der SWR dauerhaft zu tragen habe und den er dem öffentlich-rechtlichen Rundfunk insgesamt zufüge. Nicht hinnehmbar sei insbesondere, dass gemeinsame Anliegen der Stadtparlamente in Stuttgart, Freiburg und Mannheim sowie von Landtags- und Bundestagsabgeordneten, Oberbürgermeistern und weiteren Vertretern aus Politik und Gesellschaft, die Planungen zu überdenken oder zu vertagen, ohne weitere Diskussion vom Tisch gewischt wurden. Niemals zuvor, so die Feststellung, sind demokratisch legitimierte Institutionen und Parlamente von einer gebührenfinanzierten Institution in dieser Weise diskreditiert worden. Und niemals zuvor sei eine kulturpolitische Entscheidung in Presse und Politik bereits im Vorfeld so einhellig verurteilt worden, wie das Vorhaben des SWR, dem in der Öffentlichkeit bis dato niemand auch nur im Ansatz Positives abgewinnen konnte. künftiges SWR-Gebühreneinkommen nach Informationen der Kommission zur Ermittlung des Finanzbedarfs des öffentlich-rechtlichen Rundfunks derzeit nicht möglich sind. Die SWR-Annahmen, die zu der heutigen Entscheidung geführt haben, wurden nie öffentlich begründet bzw. überprüfbar gemacht. Darüber hinaus wurden Vorschläge der Fördervereine in Stuttgart und Freiburg zur Kostenreduzierung beider Orchester gänzlich ignoriert. 1. Eine breite Diskussion über den Kulturauftrag des öffentlich-rechtlichen Rundfunks, der eben nicht nur eine Frage von Rundfunkstaatsverträgen, sondern ein eminent gesellschaftspolitisches Thema ist. 2. Die nur wenige Wochen vor Ende der Amtszeit des Rundfunkrates gefällte Entscheidung muss im Licht (a) einer neuen SWR-Gremien-Zusammensetzung in 2013, (b) der aktuellen parlamentarischen Überlegungen in Land und Kommunen und (c) des eindeutigen gesellschaftlichen Votums für einen Fusionsverzicht überprüft werden. 3. Alle SWR-Handlungskriterien in der Orchesterfrage müssen transparent, überprüfbar und einer breiten Diskussion zugänglich gemacht werden. 4. Die Freundeskreis-Vorschläge zum Thema einer Kostenreduzierung sind aufzugreifen und vorurteilsfrei zu prüfen. 5. Die Auswirkungen der Fusion auf unseren Kulturstandort sind offen zu legen und öffentlich zur Diskussion zu stellen. 6. Statt sachwidrigem und beliebigem Handeln: Die gemeinsame Entwicklung konsensfähiger Alternativen. „... Ein entscheidender Punkt aus Sicht des SWR ist jedoch der, dass durch eine solche Fusion keinesfalls die musikalischen Profile, Stärken und Traditionen von SO und RSO sich gegenseitig verstärkend zusammengeführt werden können. Vielmehr würde ein völlig neu ausgerichteter Klangkörper entstehen, der sich ein eigenständiges Profil erst noch erarbeiten müsste. Faktisch würde ein solcher Schritt die Schließung zweier etablierter und erfolgreicher Klangkörper und die Neugründung eines sinfonischen Klangkörpers erfordern. Das neu zu gründende Orchester müsste sich in jahrelanger Aufbauarbeit erst wieder ein eigenständiges, unverwechselbares Profil aufbauen und es wäre keineswegs von Anfang an sichergestellt, dass dies auch gelänge. … Insgesamt wäre deshalb aus Sicht des SWR der programmliche und kulturelle Verlust zu groß ..."
It would have been difficult not to have felt some disappointment at this, which had been intended as Sir Colin Davis’s eighty-fifth birthday concert, the actual birthday having taken place two days previously. Both Sir Colin and one of the anticipated piano soloists, Dame Mitsuko Uchida, fell ill, and Radu Lupu also withdrew. The advertised Schubert Rondo in A major for piano duet, D 951, and Mozart Concerto for Two Pianos disappeared, to be replaced by a conductorless Haffner Symphony and a performance of the Four Last Songs by a soprano whose previous account of the work with the LSO had, to put it diplomatically, offered a somewhat mixed experience. The show must nevertheless go on, and this remained a concert in Sir Colin’s honour, with birthday greetings in the programme booklet from friends, colleagues, ambassadors. André Previn suggested that the two of them should check in with each other when they were 100. Anne-Sophie Mutter described him as ‘one of the half handful of my most admired musicians’: quite a claim, the more one thinks about it. Nikolaj Znaider waxed most lyrical of all: ‘Once in a while we may ... encounter a being of such force that it seems to completely alter our own course. Such is the influence of Sir Colin Davis on me. ... Sir Colin’s wisdom, humility, sincerity and above all his friendship and camaraderie shall be my northern star. The Haffner Symphony, though not initially programmed, is of course a work many of us would give a great deal to hear Sir Colin conduct. How would the LSO fare in his absence, directed by leader, Gordan Nikolitch? The first movement was on the fast side, with kettledrums (hard sticks, alas) far more prominent, almost militaristically so, than would have been the case in one's imaginary Davis performance (or indeed in his wonderful Dresden recording). At times, Mozart felt harried, lacking the flexibility that a great conductor would have imparted. The counterpoint was clear, though, and structure was delineated with equal clarity. What was missing? Above all: that smile which Messiaen wisely identified as characteristic of Mozart's music. Related to that, what the performance failed to do was to yield. The Andante came as a pleasant surprise, taken at a sensible tempo, quite ignoring fashionable trends to rush through slow movements as quickly and as graciouslessly as possible. A little more string warmth would not have gone amiss at times, but there was neither the preciosity nor the crudity that characterises those ‘authenticke’ performances which stand as distant from the humanity of Davis’s Mozart as one can imagine. Indeed, the apparent simplicity of the performance had more than a little in common with such Mozart. The minuet was hasty, robbed of its grandeur, rather fierce too; it grimaced, almost after the manner of Nikolaus Harnoncourt, rather than smiling. However, the trio relaxed, perhaps in part because the woodwind section was more prominent and less ‘directed’, though the strings were less aggressive here too. It was really rather beautiful, touching even. The brilliant finale, taken attacca, blazed like a Mannheim rocket. Finely etched dramatic contrasts contributed to a performance that for the most part felt spot on. Who needs a conductor then? Well, everyone, if that conductor is good enough. If, however, the conductor is not of the calibre of Sir Colin, one might be better off without. Anthony Payne’s ‘elaboration’ of Elgar’s Third Symphony received the best performance of the evening. Brabbins immediately seemed more at home; so in fact did the LSO. The angry opening of the first movement spoke for itself in unexaggerated fashion, the surprisingly modernistic scoring (Elgar’s own, be it noted) contrasting in almost textbook fashion with the tender, lyrical second subject. One could have no doubt that something important was at stake in the battle royal of the development, the LSO brass predictably terrific. The recapitulation was no mere return, but an intensification, weighed down by memory though always clear-eyed. There was a typical sense of loss to the scherzo, which yet emerged with more than a hint of Mendelssohn. Later on, my ears were put a little in mind of Berio’s orchestration of Brahms, revealing a certain infidelity through fidelity. It was no worse for that, of course; indeed, the movement proved all the more intriguing for it. The Adagio solenne was dark yet defiant. If its sometimes tortured post-Wagnerian chromaticism is hardly redolent of Schoenberg, it would not necessarily sound out of place in, say, Zemlinsky. I am not entirely sure that the movement does not in itself – or perhaps did not in performance – lose its way a little in the middle, but that may simply be ascribed to a lack of comprehension on my part. Was the opening of the finale a tad too excitable? Perhaps, but better that than staid. Forward impetus was impressively maintained throughout, though never at the cost of flexibility. The closing mists had shades not only of Strauss’s Alpine Symphony but perhaps even of late Mahler, coincidentally or otherwise. Tellingly, I had long since given up thinking what Davis might have done and was enjoying Brabbins’s performance on its own terms. Payne, whom I could see during that performance, was visibly involved throughout. That said, let us all hope that Sir Colin will be back at the helm of the LSO as soon as possible. This made for a disappointing opening to the LPO’s season, not the fault of the orchestra, but in many respects to be attributed to Vladimir Jurowski. The failure of the Frau ohne Schatten excerpts, despite some fine orchestral playing, may be ascribed to two principal factors: problems with Jurowski’s direction and, more gravely, the very idea of extracting parts here and there from the orchestral score, without voices, and trying to present them as some sort of coherent whole. Some people have done something similar with Wagner’s Ring, with a similar lack of success, but here Jurowski might have taken note that Strauss himself failed to make his ‘Symphonic Fantasy’ cohere. One wills it to do so, but even in the hands of Kempe, or more recently Christian Thielemann, it simply does not. At least it is shorter than this meandering hotch-potch. It opened as the operas itself does, but in Jurowski’s hands, rigid, metronomic, merely loud rather than resplendent. At times, it sounded almost like a parody of Stravinsky – and that takes some doing. Soon, moreover, the tension began to sag. Without the voices, too much of the score sounded as if we were in rehearsal rather than in concert. Moreover, a good part of it lacked a keen sense of harmonic grounding and motion, increasingly a problem from many conductors in the core Austro-German repertoire, especially when they sound superficially ‘exciting’. There was a fair bit of orchestral uncertainty too to balance against the pinpoint, almost brutal, precision of other passages, such as the opening. At least we managed to hear some impressive solo work, for instance from leader Pieter Schoeman and principal cello, Kristina Blaumane. Even the grinding dissonances just before the close failed properly to register, whilst the closing bars were merely sugary, nauseating in the wrong way. It would have been difficult to come up with a greater contrast with Bernard Haitink’s recent Vienna Philharmonic Prom performance of the Alpine Symphony. But the very premise of this performance was flawed. Perhaps Stokowski might have made something of the idea; one can imagine a time-travelling Liszt doing so on the piano. Jurowski did not. He made a better job of Zemlinsky’s Florentine Tragedy, in itself a welcome visitor to a London concert hall, though sadly not to a London stage. The obvious Straussian inspiration for Zemlinsky’s version of Wilde’s A Florentine Tragedy was of course Salome, which Zemlinsky had conducted for the first time in 1910. Both operas are in one act, though Eine Florentine Tragödie, composed between 1915 and 1916, is considerably shorter. 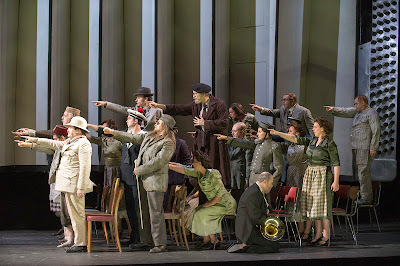 Moreover, the nauseating headiness of Strauss’s opera cast a shadow over a number of ‘late Romantic’ or ‘early modernist’ – whatever we wish to call them – operas, Schreker’s Die Gezeichneten a fine example. The links between biography and art are rarely as clear as some would like to make them, even when ironised as in a number of Strauss’s works, but the congruence of plot between opera and Mathilde Schoenberg’s affair – yes, the wife of that Schoenberg and sister of Zemlinsky – with the painter, Richard Gerstl, who then took his life when Mathilde returned to Schoenberg, is difficult to ignore. There is no love-scene as such at the opening, though there is later on, evocatively coloured by whole-tone harmonies. However, the Prelude, like that to Act I of Der Rosenkavalier, makes all clear, albeit in darker tones than Strauss had employed (though not necessarily darker in this performance). Guido, Prince of Florence, and Bianca have been indulging their passion and, upon the appearance of the merchant Simone, Bianca’s husband, hardly succeed in quieting his suspicions. It takes a dissonant duel – and Guido’s death – to have Bianca appreciate her husband, and then for his strength. Though the Prelude was driven and perhaps too bright – a little more nausea would have been to the good – we heard that this was recognisably the composer of the Lyric Symphony, surely Zemlinsky’s masterpiece. If there were times, especially early on, when Jurowski proceeded too audibly bar-by-bar, at least the basic structure of the work was apparent. (Imagine, though, Thielemann taking on such repertoire!) Slower sections in particular fared better than they had in Strauss, where they had often simply dragged. Indeed, it was generally orchestral climaxes that came off best. The real problem here lay with the singers. Whilst Heike Wessels showed occasional bloom as Bianca, both Albert Dohmen as Simone and Sergei Skorokhodov as Guido struggled to make any real impression. More often than not one could barely hear the latter above the orchestra, and the same was true too often of the former. There was no charisma, no sense of who the characters might be, of why we might care about them. At best, the score emerged as a symphonic poem with voices, something of an irony given the ill-fated Strauss first half. And so, the ominous ostinato when Simone bids Bianca spin came across with more foreboding, more frighteningly even, than one might have expected. Something of the score’s claustrophobia registered too, as did the brief – ironic? – transfiguration at the end when the remaining couple hymn each other’s strength and beauty. I suspect the opera needs a staging, perhaps of the Von heute auf morgen variety. It certainly needs a superior vocal contribution. ... and a swift recovery from the illness that, alas, will prevent him from conducting tomorrow's celebratory concert with the LSO. Valhalla is not only a stronghold of political power, but also a sacerdotal fortress — Ein’ feste Burg, in the words of the celebrated Lutheran chorale. Wotan’s initial greeting to his castle in the sky had possessed a similar magnificence to the chorale, both in the vocal line and in the full statement of the noble Valhalla motif. His words upon awakening from his dream, ‘Vollendet das ewige Werk!’ resembled those employed by the angels in The Creation in praise of God’s creativity, ‘Vollendet ist das große Werk’: ‘Achievèd is the everlasting [Wagner]/great [Haydn] work.’ Yet one of Wagner’s fundamental claims is that Wotan’s proud edifice is thoroughly illusory. As Feuerbach had proclaimed in The Essence of Christianity: ‘Religion is the dream of the human mind,’ a dream in which ‘we only see real things in the entrancing splendour of imagination and caprice, instead of in the simple daylight of reality and necessity.’ It is through the imagination alone that ‘man neutralises the opposition between God and the world’. Boulez, at work on the Ring (he conducts here), noted that our first encounter with Valhalla is in no wise a moment of triumph, for ‘Valhalla is not clearly delineated but belongs to a world of dream, phantasmagoria, and mirage.’Religion, according to Marx’s critique of Hegel, ‘is but the illusory sun, around which man will revolve for as long as he does not revolve around himself’. they who imagine [wähnen, a usage preceding Wagner's encounter with Schopenhauer] themselves so strong and enduring. once again into flickering flames. even though they be the most divine gods! That does not seem stupid to me! I shall think about it: who knows what I shall do? Alberich’s world of capital may be no better — it may even be worse — but the Nibelung’s actions have helped lay bare the illusions of Valhalla, just as the cult of Dionysus had once shattered the serenity of Olympus and thereby initiated the great religious struggle between two opposing forces immortalised in the Bacchae of Euripides (or in Henze’s most Wagnerian opera, The Bassarids). The giants’ return to claim their wages and ransom sits uneasily with the ancien régime of the gods, bringing into question any notion of divine right — or, indeed, of divinity. As Marx pointed out, ‘the relationship of industry and, in particular, the world of wealth to the political [and religious] world is one of the principal problems of modern times.’ The present ‘ancien régime’ was but ‘the comedian of a world order whose true heroes are dead,’ which therefore instead sought ‘its salvation in hypocrisy and sophistry,’ just as the gods of Æschylus had been compelled to die a second, comic death in the dialogues of Lucian. If only your lustrous glitter still shone in the depths! false [falsch] and cowardly [feig] is the rejoicing above! The music, now in the key of G-flat major, as far away as possible from the C major tonality of the gold, reminds us of the poverty of Valhalla’s grandiloquence as compared with the true splendour of the previously valueless gold. The C-flat minor chords on falsch and feig drive home the message further, piercing the unreality, the false consciousness, of Valhalla’s diatonicism. Valhalla, however recently it might have been built, is already a simulacrum — as Plato would have understood only too well. Indeed, one may doubt whether an ‘original Valhalla’ ever really existed. Those who would attempt to restore an unmediated ‘authentic’ Wagner Ring ought to take note. Julietta (or Snář, ‘The Dream-Book’) was based by Bohuslav Martinů on Georges Neveux’s play Juliette, ou La clé des songes. 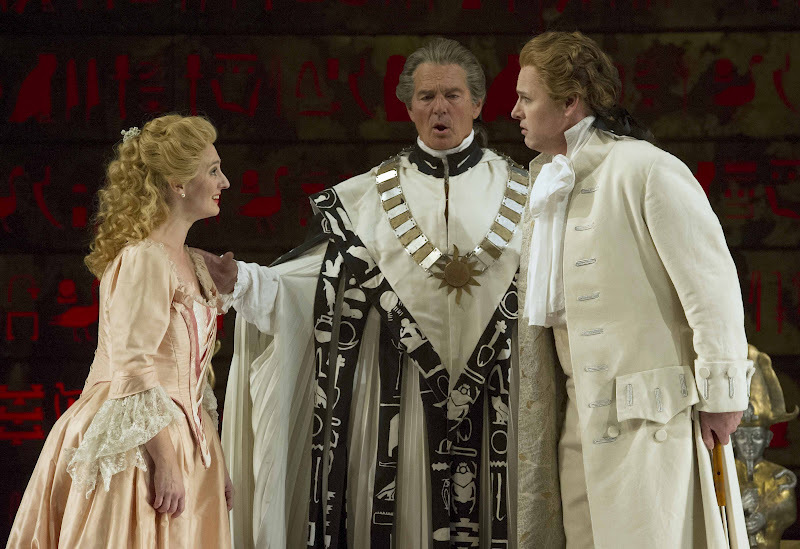 An initial French setting was discarded in favour of Czech, though this being ENO, the opera was of course performed in English, David Pountney providing a translation, which on several occasions quite mystifyingly confused singular and plural pronouns. 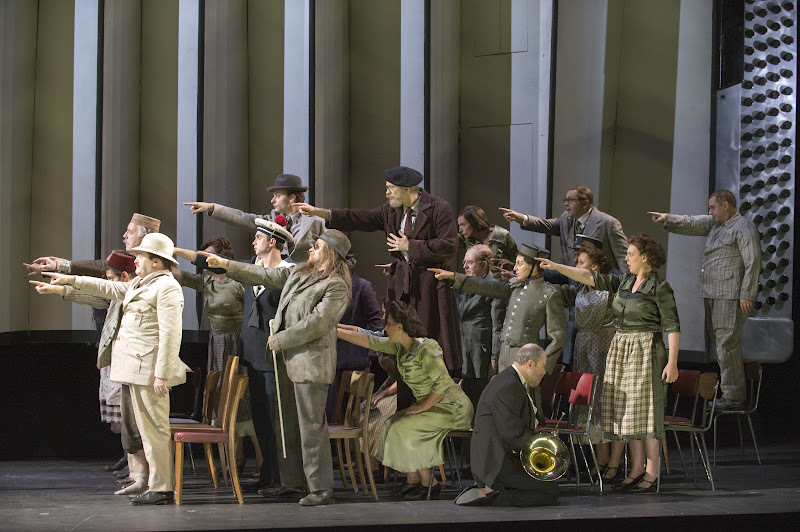 (Julietta has been performed before at the Coliseum, the first English production having been given by the New Opera Company in association with ENO, conducted by Charles Mackerras.) Michel, a Parisian bookseller, is searching for Julietta, her voice having attracted him since his previous visit three years before to the coastal town in which the action takes place. It quickly becomes clear to him and us that none of the townsfolk has a memory extending beyond a few minutes; Michel’s ability to remember sets him above them. A contrast is constructed between Julietta’s world of fantasy – she wants to hear of a past that never happened, in which she and Michel were lovers – and Michel’s world of reality. Having shot her upon her flight from a forest meeting, Michel is advised at the ‘Central Office of Dreams’ (!) that he has been dreaming and resolves to escape. However, hearing Julietta’s voice, he follows what seems to have been the route of other dreamers he has met at the office and return to her. The opening setting returns, in contrast to the end of Neveux’s play – and the original French version – in which Michel remained uncertain as to whether to return to the world of dreams. That, I am afraid, makes the opera sound considerably more interesting than it is. Surrealism dates, of course, and tends to lend itself best to something snappier: a song, perhaps, or even a song-cycle, something more filmic, or a visual artwork (if ‘snappy’ may be stretched that far). This three-act opera dragged, the composer’s attempts at soaring lyricism remaining stubbornly earthbound. That is doubtless partly a matter of the subject matter: it is difficult to care about such ‘characters’ and their wearying silliness. However, whatever Martinů’s devotees may protest, I think it is also a matter of the composer’s music itself. There is a great deal of his music I have not heard, an important proviso, yet everything I have has seemed similarly anonymous, its manifold derivations failing to cohere into a greater whole. What sounds most interesting, or rather least uninteresting, here are the passages that sound a little like (very) watered-down Janáček. Attempts to signal (relative) modernity by parading hand-me-downs from Stravinsky and Prokofiev fall flat. There is certainly compositional craft in the orchestration, and interest in the considerable use to which the piano is put, but so what, if there is nothing to say? To complain about an artwork being derivative is doubtless indicative of a post-Romantic world-view; well, so much the better for (post-)Romanticism. The music seemed well performed. If there were times when I could imagine Edward Gardner having exerted a tighter grip on proceedings, his direction was alert enough, though the orchestra sounded a little tired during the third act. Julia Sporsén proved as radiant as one could have any right to expect as Julietta, even if it were difficult not to wish that she were singing Janáček or something else more worthwhile. Peter Hoare did his best with what must be the tiring role of Michel, imparting as much credibility as the work would permit. The rest of the cast all performed creditably, often more than that. Susan Bickley offering luxury casting in the small roles of birdseller, fortune teller, and old woman, Andrew Shore likewise in three small roles, perhaps most notably the seller of memories who tries to convince Julietta and Michel that they holidayed together in Spain. 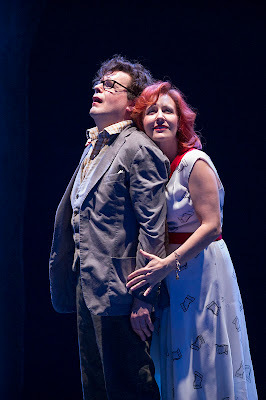 I was especially impressed by Anthony Gregory’s lyrical tenor as the Young Sailor, who asks Michel for Julietta’s shawl – here, it seemed, more of a scarf: whether staging or translation erred, I cannot say – so as to compete with his elder colleague. Again, I hope I shall hear him more gainfully employed elsewhere. The work in its general surrealist plotline might have been written to play to Richard Jones’s strengths. The designs (Antony McDonald and Ricardo Pardo) were arresting, deriving from imaginative use of a giant accordion, whose music we hear at the opening. Yet in the absence of anything to care about, we were left, hardly surprisingly, with a series of stylish images. First seen in Paris ten years ago, Jones’s production has now made it to London. Let us hope that he and a talented cast will next be offered something more substantial to which to apply themselves. There is a host of works that languish unperformed or under-performed; Martinů has had his chance. Whatever is this? I may, to put it mildly, be no fan of Verdi, yet I should hesitate to say that he, let alone Wagner, deserves the eccentric coverage served up by one Vanessa Thorpe. She is a writer - well, of sorts - who, we are told, 'became Arts Correspondent for The Observer in 1999 and went on to write on media news too. She has covered the changing world of culture and entertainment under New Labour and anticipates a fresh phase of debate and adjustment ahead across the arts.' Should the future of arts reporting lie in the hands of the likes of Ms Thorpe, the nature of such 'adjustment' may prove more radical than any of us can yet imagine. The Royal Opera is staging something called Ring Cycle, or perhaps even Covent Garden's Ring Cycle; the article's text remains slightly ambiguous. At any rate, Ring Cycle is a 'roof-raising, four-part masterpiece'. A Verdi gala in Munich will 'kick off on Boxing Day'. A little further north, Bayreuth is the 'German home of the annual festival established by Wagner himself'. Where, I wonder, is the festival's Italian home? march'. He also 'created a mythology that drew on his own turbulent personal life.' Ms Thorpe declines - I can hardly imagine why - to expand upon her claim. As for what 'the wider BBC' might be or constitute, I cannot quite bring myself to ask. Its 'significant contributions' to the anniversary year of 2013 will surely be dwarfed by further 'phase[s] of debate and adjustment' from our intrepid 'Arts Correspondent'. ‘The last-ever performances of Nicholas Hytner’s production of The Magic Flute,’ claims the programme. Maybe they are, maybe not; the same has been said before. It is, at any rate, difficult to think that they should not be. Quite why such reverence should be accorded what at best one might call a ‘straightforward’ production is beyond me. Some will doubtless applaud the lack of anything so strenuous as an idea or two, anti-intellectualism being so ingrained in certain quarters of this country’s commentariat. 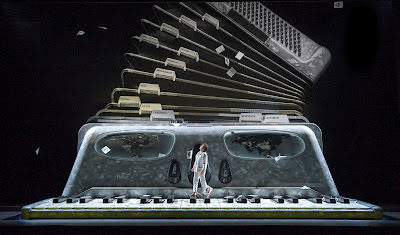 (Remember the outrage at the Royal Opera’s splendid Rusalka?) Some, ignorant of or simply uninterested in, the Rosicrucian mysteries of the work, will doubtless have been happy with a naïveté that sits at best awkwardly with our age, irreversibly ‘sentimental’ in Schiller’s sense. But surely even they would have found this revival tired, listless. Apparently some of them did not, however, given the raucous laughter issuing from around the theatre: any time a rhyming couplet appeared on the surtitles, some found it almost unbearably hilarious. Moreover, audience participation went beyond even the usual coughing, chattering, and opening of sweets. (A woman behind me must have made her way through a good quarter of the city’s stocks of Wine Gums). 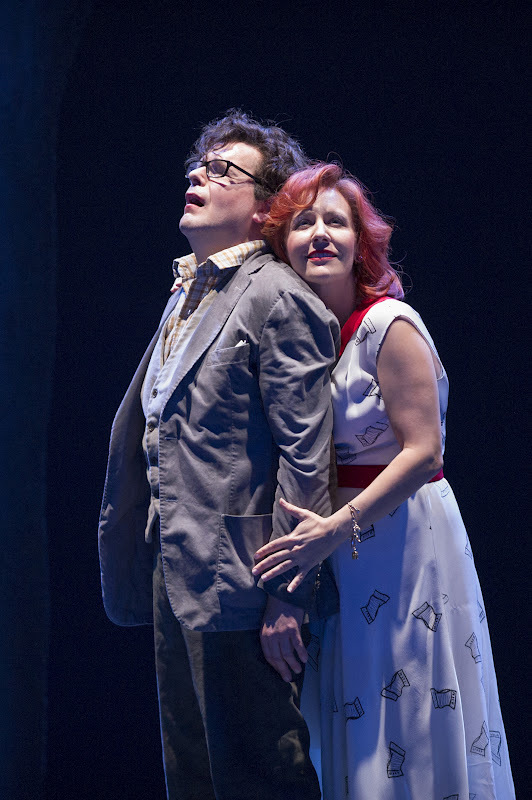 Someone even saw fit to disrupt the performance by shouting out a proposal of marriage to Papageno just at that saddest, pathos-ridden of moments when the music turns and he resolves to take his life. No matter though: it elicited a great deal of hilarity. And that of course is all that matters. Those who laughed at the priests’ dialogue may or may not have been aware how offended Mozart was at someone who did the same in the composer’s presence. Presumably the same people thought it ‘amusing’ to boo Adrian Thompson’s rather good Monostatos too. They seemed, however, a little hard of hearing, for their applause generally began long before the orchestra had concluded. Jeremy Sams’s ‘English version’ doubtless egged them on in all their boorishness. I have asked before what is held to be wrong with Schikaneder. One can point to shortcomings, no doubt, though one should always bear in mind Goethe’s admiration. But the only good thing one can really say about this hodgepodge is that it is not nearly so bad as what Sams has inflicted upon The Marriage of Figaro and Don Giovanni. It remains intensely pleased with itself, drawing attention to itself rather than shedding light upon the drama, and remains distant enough that ‘version’ is wisely substituted for ‘translation’. Yet, given the difficulties so many of the cast had with delivering the dialogue, it really might as well all have been in German. That would also have relieved us of that terrible clash between the text we know in our heads – especially for the text set to music – and that we hear on stage and/or see in the titles (the latter two not always being the same). Different accents are ‘amusingly’ employed; one might have thought it offensive to find a Welsh accent (Papagena) intrinsically funny, but apparently not. Nicholas Collon’s conducting was disappointing. One often hears far worse in Mozart nowadays; yet, as so often, it was difficult not to long for great performances of the past (Furtwängler, Böhm, Klemperer, et al. ), or indeed of the present (Sir Colin Davis). ‘Lightness’ was for the most part all, a peculiar mannerism being the falling off into nothingness at the end of many numbers. Quite why one would wish to make this score, often but a stone’s throw, if that, from Beethoven, sound so inconsequential, is beyond me; at least it was not brutalised, as ‘period’ fanatics would wish. That said, the brass sounded as if they were natural; they may or may not have been, since modern instrumentalists are sometimes instructed perversely to ape the rasping manner of their forebears, and I could not see into the pit. At any rate, the result was unpleasant. A few numbers were taken far too quickly, but for the most part it was the lack of harmonic grounding that troubled rather than speeds as such; we were spared the ludicrous Mackerras triple-speed approach to ‘Ach, ich fuhl’s,’ one of the worst atrocities I have ever had the misfortune to hear inflicted upon Mozart. But as for the lily-gliding of introducing a glockenspiel part into the final chorus... Mozart is not Monteverdi; he does not need to be ‘realised’, and certainly not like that. A good number of appoggiaturas and other instances of ornamentation were introduced to the vocal lines, not least to those of the Three Ladies at the beginning. The fashionable practice does no especial harm, I suppose, but nor does it really accomplish anything beyond drawing mild attention to itself. Vocally there was more to enjoy, though the record was mixed. 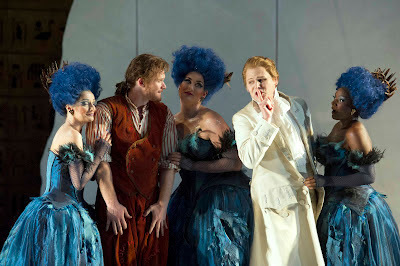 Elena Xanthoudakis made for an unusually rich-toned Pamina. Best of all was Duncan Rock’s Papageno, for the most part quite beautifully sung, though his dialogue veered confusingly between outright Australian and something less distinct. Kathryn Lewek had some difficulties with her intonation as the Queen of the Night, but then most singers do; more troubling was her tendency to slow down to cope with the coloratura. 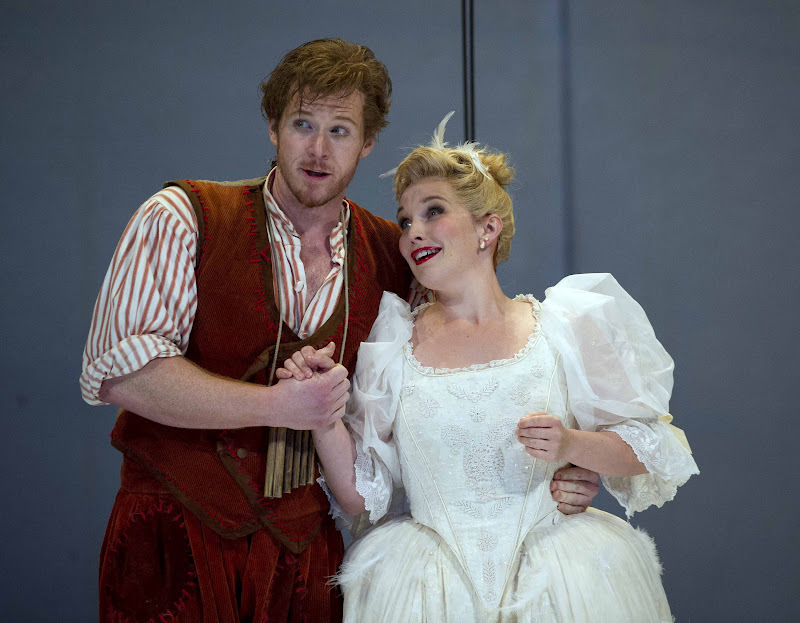 Shawn Mathey resorted to crooning more than once during his Portrait Aria and was throughout a somewhat underwhelming Tamino. Robert Lloyd’s voice is, sadly, not what it was; Sarastro’s first aria sounded very thin, though matters improved thereafter. There was luxury casting, however, when it came to the Three Ladies; Elizabeth Llewellyn is already a noted Countess, and it showed. The Three Boys were excellent too: three cheers to Edward Birchinall, Alex Karlsson, and Thomas Fetherstonhaugh. Choral singing was a bit workmanlike but that may have been as much a matter of the conducting as anything else. One certainly had little sense of the kinship with Mozart’s other Masonic music. The website and programme have the Two Armoured Men as the ‘Two Armed Men’, a strangely common yet baffling error: the German is perfectly clear. At least the production had it right, the men donning breastplates at the opening of that great chorale prelude. The Queen of the Night remains, for some reason, the ‘Queen of Night’. 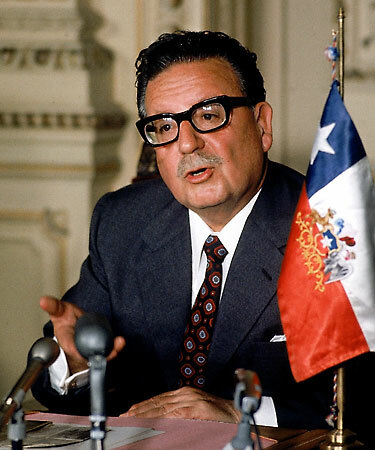 On 11 September 1973, President Salvador Allende met his death, most likely assassinated, though some still cling to the ‘official’ account of his suicide. The American-sponsored coup d’état brought a period of right-wing terror to Chile, a period symbolised by the twin imperialist brutalities of the so-called ‘Chicago School’ of economics, which treated a land hitherto peacefully moving towards socialism as a playground for their laissez-faire experiments, and the more overtly savage form practised by General Augusto Pinochet in the era of Operation Condor ‘disappearances’. Thomas Hobbes would have understood all too well, the chaos of a war of all against all requiring an especially brutish state leviathan. Hopes raised worldwide by the ‘events’ of 1968 seemed well and truly dashed, King Capital having proved yet again far more resilient than anyone might reasonably have imagined. And yet, protest never goes quite unheard, never quite becomes as marginalised as one fears at the time; after all, revolution in 1848-9, apparently defeated, would be defiantly celebrated in Wagner’s Ring – and still is. Here below are Allende’s final speech (http://www.marxists.org/archive/allende/1973/september/11.htm) and excerpts from Hans Werner Henze’s Versuch über Schweine, its text by Gaston Salvatore, Allende’s nephew, and Wagner's effort to make clear 'to the men of the revolution the meaning of that revolution'. My words do not have bitterness but disappointment. May they be a moral punishment for those who have betrayed their oath: soldiers of Chile, titular commanders in chief, Admiral Merino, who has designated himself Commander of the Navy, and Mr. Mendoza, the despicable general who only yesterday pledged his fidelity and loyalty to the Government, and who also has appointed himself Chief of the Carabineros. I address the youth, those who sang and gave us their joy and their spirit of struggle. I address the man of Chile, the worker, the farmer, the intellectual, those who will be persecuted, because in our country fascism has been already present for many hours -- in terrorist attacks, blowing up the bridges, cutting the railroad tracks, destroying the oil and gas pipelines, in the face of the silence of those who had the obligation to protect them. They were committed. History will judge them. What a joy to hear Haydn performed as music – and as symphonic music every inch as rigorous as that of Beethoven! The number of conductors alive who are able and willing to do so is small, but Bernard Haitink may certainly be counted amongst them. It does no harm, of course, when the orchestra is the Vienna Philharmonic, which will most likely decline to cooperate if a conductor attempts ‘authenticke’ – which, as we must never cease to remind ourselves, is nothing of the sort – perversity. The gravity of the first movement introduction and its thematically generative role were brought out with near perfection, Haydn’s score sounding extremely close to The Creation, which it is. It would have been well nigh impossible, here and elsewhere, to conceive of more cultivated string playing. The exposition proper (repeated) and indeed the rest of the movement showed ‘monothematicism’ for what it is: far more an expression of thematic rigour, of an especial tightness of motivic construction, of every note being essential, than a restriction upon melodic invention. It is almost always a misnomer, but we are probably stuck with it, so may as well make the most of the situation. For the argument was finely articulated – in more than one sense – throughout; it may be a hoary cliché, but in Haitink’s hands, the music seemed simply to speak for itself. The slow movement bore more obvious signs of Haitink’s recent Beethoven, not always for the better, for it was really quite brisk indeed. The music can work at such a tempo, just about, but the problem was really that it did not smile. Sir Colin Davis knows how to accomplish that; so does Pierre Boulez, whose wonderful VPO recording – no, it is not a figment of my imagination! – lacks nothing in true Haydnesque grandeur either. Still, there was undeniable symphonic rigour to Haitink’s reading, not least in its delineation of the composer’s complex yet seemingly effortless counterpoint. (Not for nothing did HC Robbins Landon observe that Haydn was the last composer for whom the fugue was a natural means of expression as opposed to a tour de force. If an exaggeration, it is a pardonable exaggeration.) The third movement certainly did not drag, but remained a minuet rather than a scherzo manqué. Again, Haydn’s compositional accomplishment, his sheer inventiveness, came unexaggeratedly to the fore. Here, as in the previous movements, Haitink’s use of silence told, putting one in mind of his Bruckner. If the trio sounded close to Beethoven in its thematic working out, that is only because it genuinely is. The drone bass of the finale sounded, unsurprisingly, as a musical necessity rather than an ‘effect’, as it almost certainly would in an Harnoncourt-style freak show. It set the tone for the dynamism of the rest of the movement: everything necessary, everything connected. What a signing off this is to one of the greatest of all symphonic careers! Attacks upon Strauss’s Alpine Symphony are, if anything, still more tedious than those suffered by many other of Strauss’s works. Anyone is free not to ‘like’ it, of course; liking, let alone love, cannot be commanded. But failing to grasp its structure and considering it simply in pictorial terms marks a failure, albeit a failure that may well be attributable to poor performances. Listen, say, to Mravinsky but once, and you will never have that excuse again. One might say the same of Haitink and the VPO. Very fond though I may be of Christian Thielemann’s recording with this orchestra, Haitink’s intent upon symphonism, different from Haydn’s and yet at times harking back to Classical roots, arguably stands closer to the requirements of the defence. Even when relishing the dark Wagnerian tones of the opening, Haitink’s reading was far more than merely ‘atmospheric’. Likewise the glorious sunrise. (Though we tend to listen to Strauss far more for the setting than the rising of the sun, as Karajan acknowledged when claiming that he conducted this work for the sake of the Epilogue.) Ascent and later descent were as symphonic as I can recall; we can deal in Nietzschean metaphor here, and doubtless should, but we can equally deal in post-Lisztian, even post-Beethovenian form. And those golden horns, the sweetness of those Viennese strings...! The performance lacked nothing in pictorial terms, whether at the waterfall, or when hearing from the cowbells or the wind-machine, but those terms never became the point. Climaxes told, but were never milked. To what may for some have been a surprising extent, much of Strauss’s score emerged as chamber-like, even as soloistic, as a symphony by Mahler. The sickly sweetness of the phantasmagorical ‘Vision’ was finely judged: undoubtedly present and meaningful, but without indulgence. Organ entries sometimes sounded a little abrupt, block-like; I could not help but wonder whether some judicious use of the swell pedal, or at least more imaginative registration, might have helped, but if that is the only real criticism I can offer... Finally, the glow of the Epilogue simply sounded ‘right’: historically as well as scenically evocative. The lights were going out all over Europe; their relighting we still await.